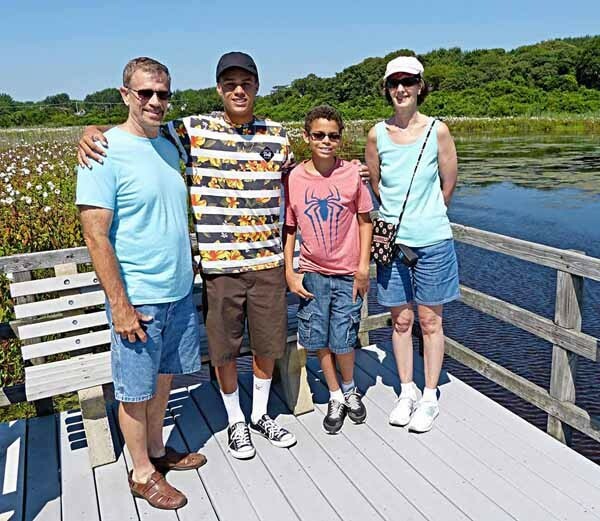 This entry was posted in Baseball, Family and Friends on July 26, 2015 by Todd. Guess the Phillies’ great season was too good to last. Hope Ryan Howard recovers from his final out injury. I’m done with baseball for this year, time to get more reading done! This entry was posted in Baseball on October 8, 2011 by Todd. 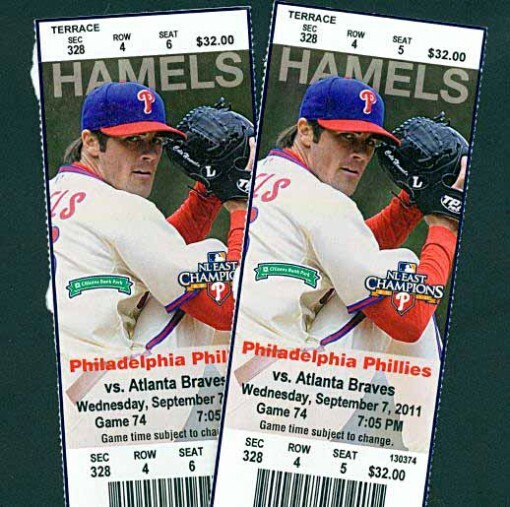 Ellen and I had tickets for the Phillies game last night, and were wondering how wet it would be. Tuesday’s game it rained throughout, but the Phillies are up against it now schedule-wise, and they played through the rain after a two-hour delay. The forecast for Wednesday was not much better, and all day, while I worked, I kept checking the weather map on TV. There was lots of rain, but it remained just west of Philadelphia, so things were dry thus far. After Ellen got home from work and fed the cats we drove to the stadium, about an hour and 20 minutes, arriving around 6 PM. 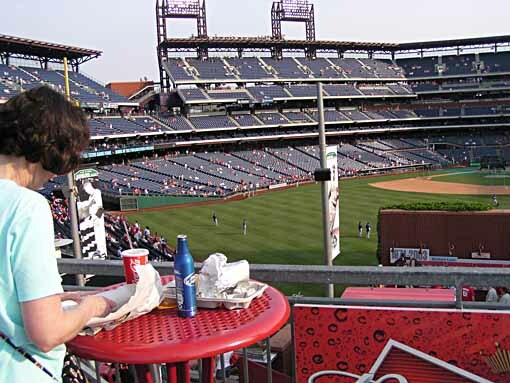 While we had our dinner outside in Ashburn Alley (veggie hoagie for her, roast pork for me), we saw two of the Phillies’ TV broadcasters doing a live spot on the level just below us. 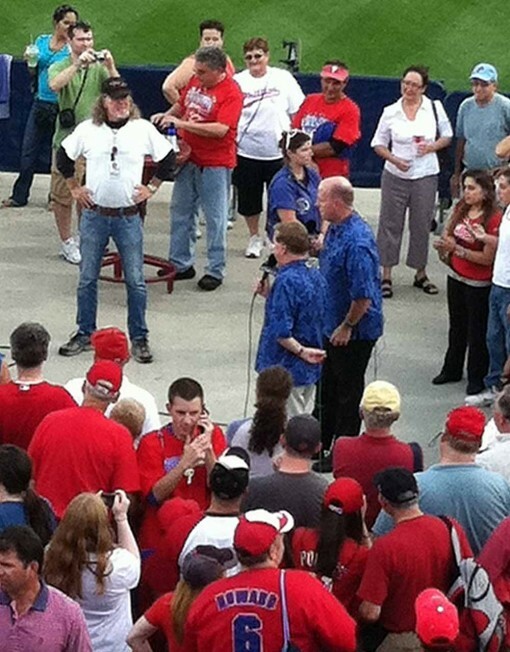 Wheels and Tom are two of the three guys we see all the time on most Phillies broadcasts, so it was fun to see them. After we finished eating we went down for a closer look, but the broadcast was over by then. Tom was very friendly with the fans, posing for many pictures with them. We walked around until nearly 7 PM, then took our seats on the third level. The rain was holding off to the west, and the sky was blue over the stadium as the game began, and fortunately it did not rain at all during the game. Oswalt was pitching, and we’d seen him do poorly on our last visit here, but he did much better this time. Raul Ibanez hit a home run early in the game, so we finally got to see one (our first live), but the Atlanta Braves played well, with a great performance from their pitcher Beachy. 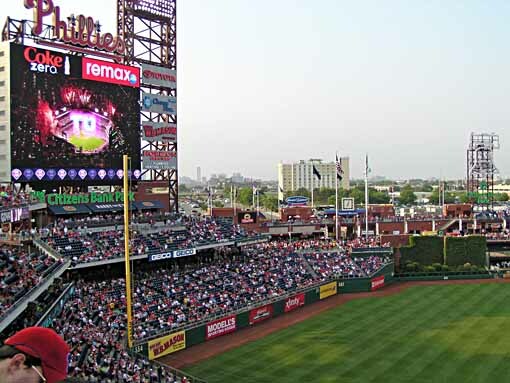 Late in the game the Braves pulled ahead 2-1, but the Phillies tied it 2-2 in the 8th. The top of the 9th Madsen kept the Braves from scoring, and in the bottom of the 9th, with two outs, Ross Gload hit a double that drove in the winning run. What a great ending to a fun game! Ellen declared Gload her hero, because his success meant we’d be able to leave the game at 10 PM instead of having to sit through extra innings. As always it was a long wait in the parking lot to get out and a long drive home, we got back around midnight. And today is a work day, so we were up at 5 as usual. We’ll be sleep-deprived today, but it’s worth it to see our team in person in this, their best year ever. Now 10 and a half games ahead of Atlanta in our division, the playoff spot is not far off. We’ll probably face the Braves again then. Bring them on! This entry was posted in Baseball on September 8, 2011 by Todd. 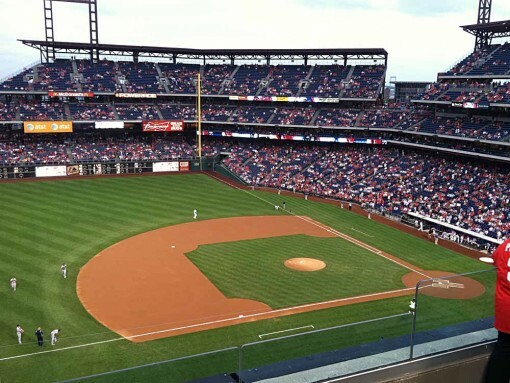 Ellen and I have been following the Philadelphia Phillies baseball team on TV for a few years now (me more than her), and last year we attended our first game. We had a great time, so this year, when Ellen’s boss offered some tickets from a package she bought, we grabbed two games. 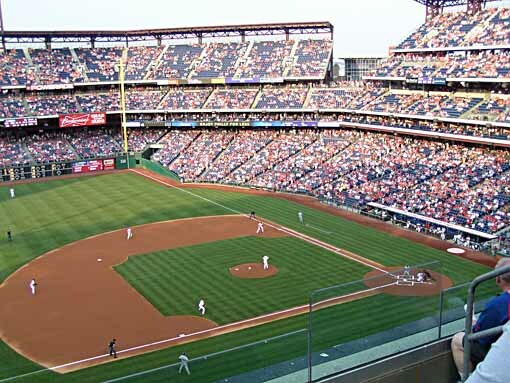 Last night was the first of them, Phillies against the LA Dodgers. As you approach the park from the north side, this is what you see. Inside it was time for dinner, and I’d researched vegetarian options for Ellen, who doesn’t eat meat. “Planet Hoagie” was the best choice, and we each got one, though mine had chicken in it. Ashburn Alley is the food and retail area behind the outfield, and we took our dinner up on the roof patio where we had a pretty good view of batting practice on the field while we ate. The weather was great, hot but not stifling, and sunny, with a steady breeze. Our seats were on the third tier on the third base side. Due to the height, quite a bit further from the field than last year, but you could see everything clearly, and the giant screen replayed the close plays. Just to the right of it you can see a little of the Philly skyline. Here’s our view of the field with the Dodgers up. I wish I could report we saw a great game, but in fact it was pretty awful for Phillies fans. The team played poorly, making a number of errors and still not hitting well. 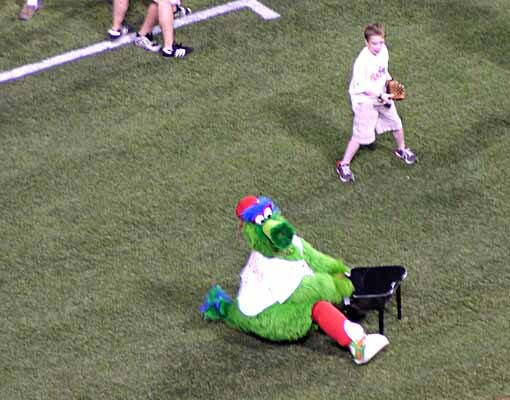 The Philly Phanatic was entertaining, as always. I’m not a fan of team mascots, or people dressed in silly costumes generally, but this guy (or guys?) really are good. Here he’s clowning with some kids doing a quick music number. We had fun, enjoyed the park, the atmosphere and the food, but not the game so much. The schedule for baseball sure is relentless. As I type this, the teams are about to go at it again. No other sport has players competing almost every day for six months straight, at least in this country, and you can see how it wears out the players. But, no excuses, they need to do better or they’ll soon be out of their current first place in the division. 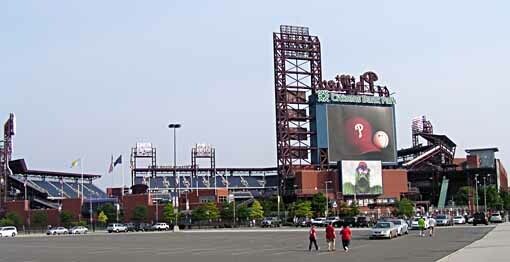 The Phillies lost this one 6 to 2. Our other game is in September, hope they’re playing better then! This entry was posted in Baseball on June 8, 2011 by Todd. Phillies: two up, 160 to go! We missed watching the opening day game because of a mislabeled cable channel recording, but enjoyed last night’s game. 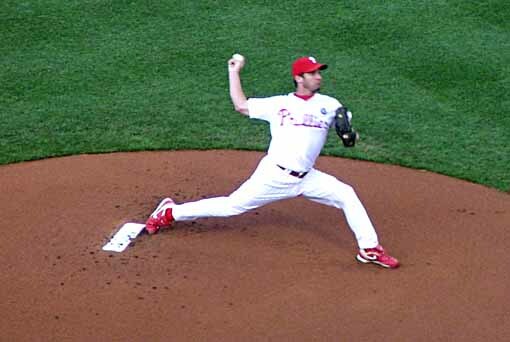 The much touted four ace pitchers, above, Halladay, Oswalt, Hamels and Lee, are off to a good start. We’ll be watching as often as we can, and hope to get to at least one game this year. Go Phillies! This entry was posted in Baseball on April 3, 2011 by Todd.